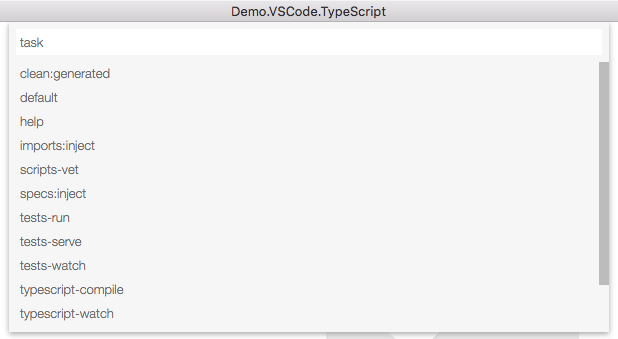 You can download the code for a sample VS Code TypeScript project from my Demo.VSCode.TypeScript repository on GitHub. 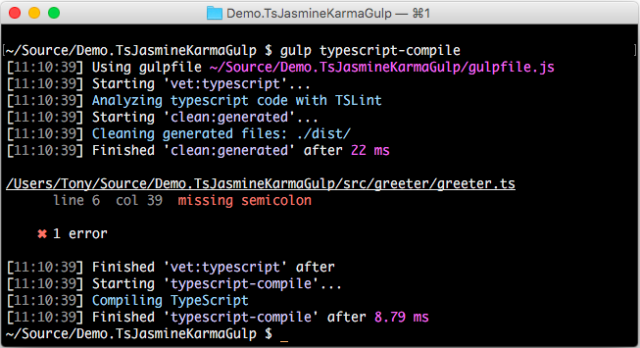 I also published a Yeoman generator called tonysneed-vscode-typescript, which provides scaffolding for a new TypeScript Library project with unit testing support from Jasmine, Karma and Gulp. 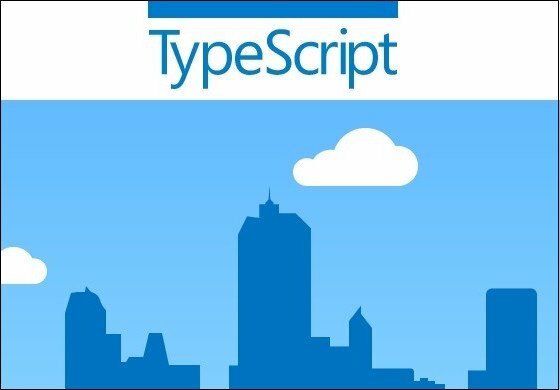 Once I decided to embark on the adventure of learning TypeScript, the next question was: What development tools should I use? I like Visual Studio because I can use it to justify to my company why I need to buy better hardware, so I can run VS and get acceptable performance. That’s how I ended up with a 1 TB SSD and 16 GB of RAM — thank you Visual Studio! I also own a MacBook Air, mainly because of Apple’s superior hardware, and run a Windows 10 virtual machine so that I can use Visual Studio and Office. But I thought it would be nice to be able to write TypeScript directly on my Mac without having to spin up a Windows VM, which can drain my laptop’s battery. So I thought I would give Visual Studio Code a try. You can download the code for a sample VS 2015 TypeScript project from my Demo.VS2015.TypeScript repository on GitHub. Visual Studio 2015 still required me to do some work to create a basic TypeScript project with some unit tests, and if I wanted to add other features, such as linting my TypeScript or automatically refreshing the browser when I changed my code, then I would have to use npm or a task runner such as Grunt or Gulp. This helped tip the scales for me in favor of Visual Studio Code. VS Code is actually positioned as something between a simple code editor, such as Atom, Brackets or SublimeText, and a full fledged IDE like Visual Studio or WebStorm. The main difference is that VS Code lacks a “File, New Project” command for creating a new type of project with all the necessary files. This means you either have to start from scratch or select a Yeoman generator to scaffold a new project. The truth is, I couldn’t find an existing generator that met my needs, and I wanted to learn all I could from the experience of getting VS Code ready for TypeScript. The result was a sample project on GitHub (Demo.VSCode.TypeScript) and a Yeoman generator (tonysneed-vscode-typescript) for scaffolding new TypeScript projects. Here is the content of the ‘tsconfig.json’ file. Note that both ‘rootDir’ and ‘outDir’ must be set in order to preserve directory structure in the ‘dist’ folder. I could then enable debugging of TypeScript in Visual Studio Code by adding a ‘launch.json’ file to the ‘.vscode’ directory and including a configuration for debugging the currently selected TypeScript file. Then I could simply open ‘greeter.ts’ and press F5 to launch the debugger and break on the first line. While compiling and debugging TypeScript was a good first step, I also wanted to be able to lint my code using tslint. 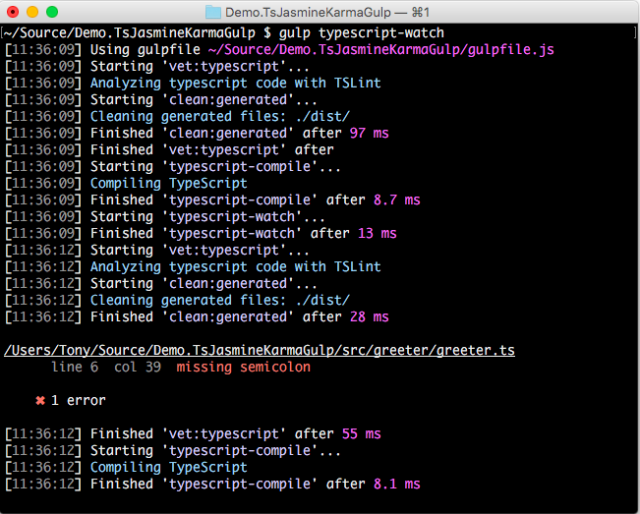 So I added a gulp task called ‘vet:typescript’ and configured my ‘typescript-compile’ task to be dependent on it. The result was that, if I for example removed a semicolon from my Greeter class and compiled my project from the terminal, I would see a linting error displayed. I also wanted to be able to compile TypeScript simply by pressing Cmd+B. That was easy because VS Code will use a Gulpfile if one is present. Simply specify ‘gulp’ for the command and ‘typescript-compile’ for the task name, then set ‘isBuildCommand’ to true. Lastly, I thought it would be cool to run a task that watches my TypeScript files for changes and automatically re-compiles them. So I added yet another gulp task, called ‘typescript-watch’, which first compiles the .ts files, then watches for changes. I could then execute this task from the command line. Here you can see output shown in the terminal when a semicolon is removed from a .ts file. It is also possible to execute a gulp task from within VS Code. Press Cmd+P, type ‘task’ and hit the spacebar to see the available gulp tasks. You can select a task by typing part of the name, then press Enter to execute the task. To get started using Yeoman, you’ll need to install Yeoman with the Node Package Manager. 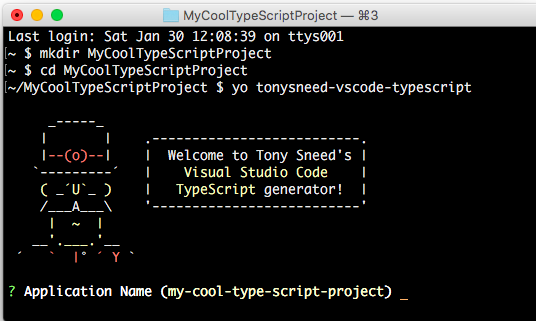 Next install the tonysneed-vscode-typescript Yeoman generator. To use the generator you should first create the directory where you wish to place your scaffolded TypeScript project. Then simply run the Yeoman generator. To view optional arguments, you can append –help to the command. Another option is to skip installation of npm dependencies by supplying an argument of –skip-install, in which case you can install the dependencies later by executing npm install from the terminal. In response to the prompt for Application Name, you can either press Enter to accept the default name, based on the current directory name, or enter a new application name. 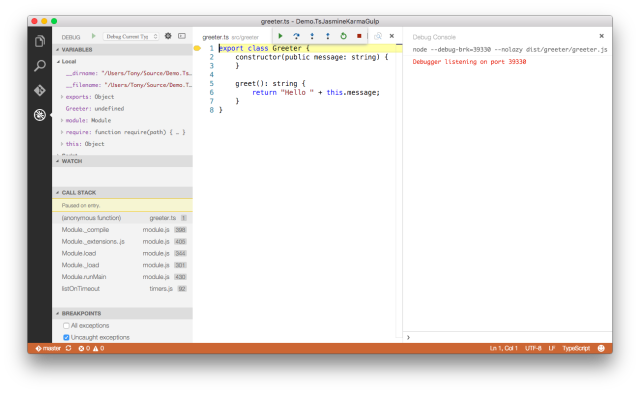 Once the generator has scaffolded your project, you can open it in Visual Studio Code from the terminal. For the next post in this series I will explain how you can add unit tests to your TypeScript project, and how you can configure test runners that can be run locally as well as incorporated into your build process for continuous integration. Reference: Getting Visual Studio Code Ready for TypeScript from our NCG partner Tony Sneed at the Tony Sneed’s Blog blog.